The prodromal symptoms of rubella (coryza, sore throat, low–grade fever), herald the onset of viraemia. They are generally mild and insignificant, and less frequent in children. In susceptible individuals, the enlargement of the post–auricular and posterior cervical lymph nodes appears as early as a week before the appearance of the rash. This however, is not pathognomonic since cases of clinical rubella without enlargement of lymph nodes have been documented. The glands may be found enlarged for 10 to 14 days after the rash. The rash is often the first indication of the disease in children. It appears first on the face, usually within 24 hours of the onset of prodromal symptoms. It is a minute, discrete, pinkish, macular rash and not confluent as the rash of measles. Conjunctivitis may occur. The rash spreads rapidly to the trunk and the extremities, by which time it is often no longer apparent on the face. The rash spreads much faster and clears more rapidly than the rash of measles. It disappears altogether by the third day. The rash is an inconstant feature of the disease. It is absent in sub–clinical cases. The incidence of rubella infection without rash may be up to 25%. In rare instances, arthralgia may occur in several joints in adults, especially young women. Encephalitis is very rare. Thrombocytopenic purpura has also been observed as a complication. Mention has been made already about the congenital malformations. Due to the mildness and variability of its symptoms, the disease could remain unrecognized unless it is an epidemic. A definitive diagnosis of rubella is possible only through virus isolation and serology. Throat swabs should be cultured for virus isolation, it takes longer than serological diagnosis. The most widely used serological test is the Hemagglutination Inhibition Test (HIT) developed in 1966. Two blood samples are taken, the first sample within five days after the onset of illness, and the second, two weeks later. A fourfold rise in HL antibody titer in paired sera and presence of igM in a single serum sample obtained two weeks after the rash is diagnostic of recent rubella infection. More sensitive serological tests includes the ELISHA test and radio–immune assay. 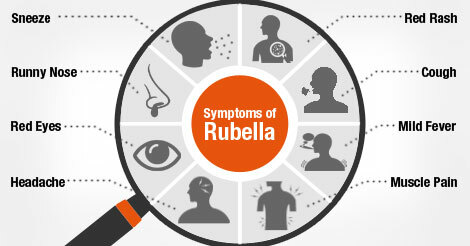 Rubella Vaccine: This vaccine is administered in a single dose of 0.5 ml subcutaneously. After vaccination, the person may present with symptoms like fever, malaise, mild rash and arthralgia (pain in the joints). Infants under one year of age should not be vaccinated. The rubella vaccine is contraindicated in pregnancy. The vaccine also comes in a combined form of measles, mumps and rubella vaccine.